'Alicematic Heroes' New Official Release Date: June 14th! Alicematic Heroes has arrived a little early, and will be officially released on June 14th! Alicematic Heroes is a new title from Manifest Destiny and prolific game designer, Kuro. 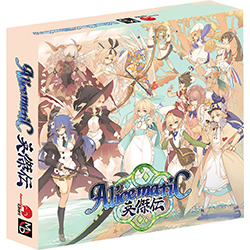 Alicematic Heroes is a quick yet tactical strategic area majority board game - based on the beloved story, Alice in Wonderland - with an engine-building mechanism for 3-5 players! It's a new adventure in Wonderland! Preorder Alicematic Heroes (JPG145) now!